LAST CHANCE: Enter to Win a Voltaic Laptop-Charging Solar Backpack Filled With Green School Supplies (Worth $500)! Heads up students! September is just one week away and school bells are already ringing in the distance – which means it’s high time to start gearing up for the coming academic year. If you’ve yet to stock up on supplies, fear not – we’re offering you a chance to win an amazing back to school bundle packed with over $500 worth of green goodies! 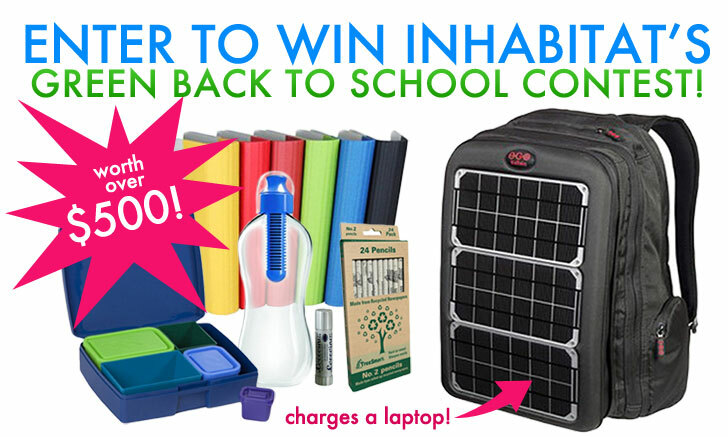 You could win a powerful laptop-charging Voltaic Array solar backpack, a stack of 6 eco-friendly Naked Binders, a water filtering Bobble bottle, and courtesy of The Ultimate Green Store, a Laptop Lunchbox and various school supplies! It’s easy to enter – all you have to do is sign up for our newsletter, like Inhabitat and Voltaic on Facebook, and leave a comment below telling us how you plan to green your back-to-school routine. Our contest ends this week, so don’t delay – enter today! (If you are not already a subscriber.) We’ll be announcing the winner in our weekly newsletter, so if you want to find out who won, you’ll need to receive it in order to claim your prize! Just visit Inhabitat’s Facebook page and Voltaic’s Facebook page and click on the “Like” button at the top. Tell us how you plan to green your back-to-school routine this year.The deadline for this giveaway is August 29th. We’ll pick the comment we like best and announce the winner in our newsletter, so make sure you’re signed up! Students are always on the go, and it’s hard to keep a laptop charged while trekking from class to class. Solar bags offer a smart low-impact charging solution – and Voltaic sets the bar by which all photovoltaic bags are judged. Their new Array Backpack is a cutting edge powerhouse emblazoned with a removable 10 watt solar panel that is capable of charging a laptop! The Array also features a battery that doubles your notebook’s runtime (when fully charged), a padded laptop sleeve, plenty of organization pockets, and 1,500 cubic inches of storage for all of your books, binders, bits, and Bobbles. 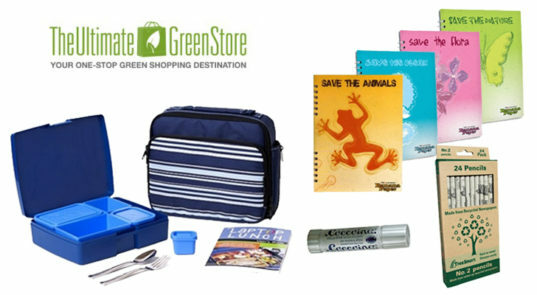 The Ultimate Green Store carries an incredible selection of eco-friendly products for the home, office and everyone in the family – and this year we’re excited to partner up with them to offer students a great array of back to school supplies! The set includes a reusable bpa-free bento box from Laptop Lunches, a recycled banana paper notebook, a non-toxic petroleum-free Coccoina glue stick (which smells like Italian Marzipan! ), and a set of recycled newspaper pencils. Sign up for The Ultimate Green Store’s newsletter here. Everyone knows that bottled water is bad for the environment, so kick Arrowhead and Evian to the curb and score one of Karim Rashid‘s acclaimed reusable Bobble bottles. These brilliant BPA-free recycled plastic bottles are fitted with a colorful carbon filter that purifies water as you drink – so you’ll always have access to a fresh source of H2O wherever your studies take you. Keep all of your papers and assignments in check all year-long with a set of six colorful Naked Binders and a stack of organization sleeves. 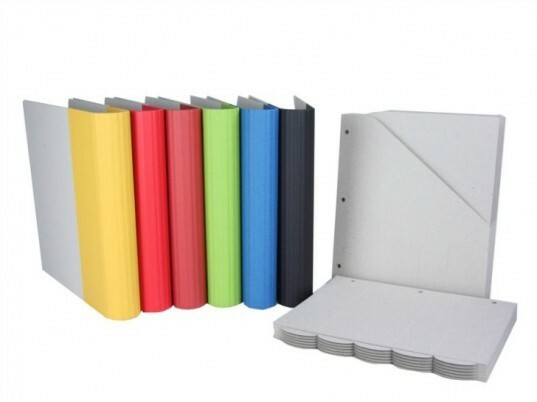 These colorful, sturdy binders are made from 100% recycled, 100% post consumer board, and they’re tested to withstand 250,000 flexes without fail – so you’ll be able to use them well into the future. Naked Binders are also 100% recyclable, made in the USA, and nearly all materials used are FSC certified. Im a mother of grade school twins, and plan to start school myself. This will really help me, keeping my laptop, tablet, and phone all charged with my busy schedule. I live in Indonesia where the sun rising up high enough to make the solar panel more useful. this backpack will also help me to charge my laptop when its run out of battery. I live alone in the big city where i cannot always affort to prepare lunch for my own and this could be useful for me. I use a reusable container when I take food to go from the dining hall, I take short showers to conserve water, i unplug chargers once devices are charged, and I use a reusable water bottle instead of buying cases of water and recycle whenever possible. Bus and bike rides and loads of walking, a refillable bamboo tea / coffee mug, and a bamboo lunch box with waste free home made lunches, plus my refillable Black and Bloom Charcoal Filter Water bottle are my tools of trade and of course no printing. I will stay green by getting natural products! I plan on driving only when absolutely necessary. I also plan on using reusable containers for my lunches instead of disposable sandwich bags. I also plan on using a solar charger for my electronic devices as often as possible. This semester I'll be studying in Girona, Spain and practicing my Español. I'll also be working with local WWOOFers on organic farms. What better way to celebrate sustainability in the new school year than with an awesome array of earth friendly back to school supplies! BrownPaper bags for everyone... re usable zip locks bags.. I don't need a solar backpack or school supplies, but would love to give one to a low-income student in the community. We live in a place that gets 300 days of sun per year and I would love to bless a migrant or low-income student with this backpack and school supplies. I need this backpack because I live in Indonesia, a country which having summer around half year. so it's must be so useful to me. I am trying to buy non-plastic alternatives to glue sticks and white board markers, but I can\\\'t find any!!! I will reduce my footprint by leaps and pounds, get it. ;) Walking to and from school and any events possible, w eight loss will be an added bonus while energy use and pollution are reduced. Constantly buying energy efficient products to save money and the environment and this would go along great! Did task 1 and 2. Now I plan to green up my school year by bringing all natural products in my lunch, nothing that comes in packages instead i'll be having fruits, veggies, and sandwiches all in reusable containers. By doing this I won't only be saving the environment, but I will also be making myself healthier!! Bike to school as often as I can, use reusable grocery bags, water bottles, coffee cups, shop locally, and try to purchase as many things as I can used (the purest form of recycling!). We'll use reusable bottles instead of plastic ones. Wow this is a really nice contest! I'd love this solar backpack for going back to college! What a great looking design! From electric cars to green roofs, from eco-kettles to solar powered cellphones, the last decade has been revolutionary with green solutions for our daily lives. As I walk to school, I worry no more about using my school apps on an uncharged galaxy note. I whip out my laptop at the bus stop and worry no more about charging my smartphone or my laptop - my new Voltaic backpack is charging them as I study! I walk out of class and head over to the coffee shop - ooh, I can sit outside and charge all my devices while I sip a latte. As I walk between classes, I can rest easy - I can take notes on my tablet and look at my flashcards app on my phone without looking around for an outlet. Somewhere, a coal miner can work a little less - I'm one in 6 billion using a little less energy - doing my part! in the newsletter where the winner is announced, a blank space resides. at least in my email. Congrats to the winner. My kid would love this and use the heck out of it! Roller skating is my new way to go from my house to the University, I live in Querétaro, México. I've just tried this transportation method because the public transport service is a mess. I think is my little gift to the sustainability of our planet not taking the bus or using my car. From my house to the University are about 6.5 km, so taking that backpack on me while skating through the city would be awesome. By the way, the weather here is awesome, about 28°C. Thanks Inhabitat and Voltaic System for this GREAT opportunity! Good luck to everyone! I plan on greening my back to school year by: Reusing old notebooks. I have a tendency to save paper even with one side used. I cycle to school and back (with the exception of those frigid winters!). I won't leave my charger plugged into my laptop if I'm not using it. I'll be bringing a water bottle and packing my own lunch so we don't have to deal with any more waste. My most determined goal is to demand an energy policy for my school that leaves so many lights on at night. I hope you support this!! I live in florence (italy) and I make every day 13 km to go work and study visual communication...and other 13 km to come back at home, BUT! only on bicycle. Is realy hard but I realy want to be a good guy. If you give me the prize i promise to show you, with many photos, your amazing solar pack on Ponte Vecchio and the others amazing art places of my city! I need a little motivation to don't give up to be a cyclist! give me your solar pack here the sun is realy hot! PLEASE! :D Ciao! I'm a 24 year old teacher and I would use all of these things to positively influence my students to become more eco-friendly. Not only would I use all of it, I would include it in my 'how to lesson your human footprint' lesson. Having these things in class instead of just pictures would really make a difference. Please pick me! Plan to go green in everyway using reusable containers, walking, carpooling when riding in a vehicle. I'm also learning to sew and hoping to repair the clothes I and my dogs have destroyed. If that isn't green enough, I don't know what is!! This year I'm going to use less plastics and create less waste. I'll bring my own lunches with me to school and work, in a reusable tupperware. Buying food in bulk helps cut back on packaging, so I'll be doing that as much as possible. One time use bottles are terribly wasteful so I'll continue to bring my own drinks in sturdy reusable form. Biking and taking public transit are the final steps to my green school routine, but I'm always on the lookout for new ideas. I'll be checking in on the Inhabitat page for more tips to green up fall 2012, and also Voltaic to see what other cool eco-awesome products they have. Thanks. I attend school online, so my classroom is wherever I want it to be. This means I am on the go constantly. Instead of purchasing food, beverages, etc. on the way, I plan to use more reusable containers and reduce waste. A recharging backpack like this would help in that I would not need to purchase items at establishments where I could recharge my laptop for school use, as well. We recently rid ourselves of the family car. We all either walk to work or school or ride public transportation. We have also made the commitment to bring our lunches in reusable containers- no more plastic sandwich bags! I recently discovered Inhabitat and love the inspirational and thought-provoking stories as well as the tips and products. I love environment and I love gadget especially Eco-friendly equipment like this! I can be the trend-setter in my college by winning this bag! I want to give my house mates the awareness on how important it is to switch off the electric equipment when not in use. I know this bag will give impact to my house mates especially to me as this is a cool yet Eco-friendly bag! I also wanted to bring my friends to go out for some refreshing outdoor activities in green environment to open their eyes toward appreciation of the Mother Earth and to improve their health. You know what? I can bring this bag and also the bottle for the outdoor activities! I want the backpack. With it I don't need to keep charging my laptop all the time anymore :) Huuray!!! i have been educating my kids on alternative energy sources. our aim is to be off the grid, and self sustaining, in the next two years. this would be a great step toward that, to show them that it can be done, even at this level. and i would love it if they could set an example to their friends at school. and their teachers. and the world. Just the thing for my new college student!! First, the commute. I'm working on my JD in Fort Worth, but I live in Dallas. That's a 30+ mile commute. I got a discount train pass, and I plan on using that to lower my carbon footprint and get some studying done during the trip. Second, the coffee. Like most students, I'm super busy, so coffee is a necessity. Instead of running to the big chain a block away every time I need a fix, I'm going to make it at school. I keep a single-serve French press and travel cup in my locker along with a bag of locally roasted coffee. This way there is no wasted paper cup, I save money, and things stay local. Lastly, I'm president of the Environmental Law society at my school and we always cater our events to get more students to participate. This year we're switching to green caterers (locally grown food, little waste) and we're going to tell students to bring their out utensils to the meetings. If they don't, we'll provide charge $1. After costs are deducted, this money will go to fund a local clean-up project at the lake we're doing for community service. Well i just got my bachelors of science in design and i am moving to Portland to get my masters of architecture. The reason i picked University of Oregon was because of there emphasis on sustainability. So if i had all of these awesome green equipment, it will only be helping me learn more about "being green." I plan on taking neater notes on word documents, using and sending pdf's. I also plan to make my own fresh lunches, and since I'm a senior, I also get to have lunch in a picninc area outside, so I hope to get some more contact with nature in the middle of the day. Sustainable regenerating existing power sources are needed for every day gadgets so that they proliferate and overtake the corporate monopolies and humans can concentrate on bettering rather than working to survive. I would love to pay the power companies less and vote for real energy with my wallet. Dear inhabitat, you’re interested in how we’re going green this school year just as much as I’m interested in the prize there. I’m Michael by the way. I’ve been crunching the tests and books down to an English Major’s degree, but that’s only the start. Eventually let us both hope it’ll turn into a Ph.D. That’s just the daily job though. Writing the city waste department, local stores, and the only recycling company here to see if a local waste job can be opened to obtain waste and push it towards the recycled world versus landfill. My other lovely half is a drafter we’re much interested in moving to Taos, New Mexico to get some hands on experience with the earthship sustainable housing projects. After the studies are finish which should include foreign languages we’ll be ready for abroad travel with the kids. Finishing up some computer certifications outside of school like your common CCNA. Curious if we can’t integrate a wireless networking system that’ll be a developed concept in our sustainable housing communities we hope to establish globally. Your little goody pack would serve us well as we finish up our academic studies and be a useful reminder to our four children as reasons to never stop dreaming big when it comes to taking care of the thing you cherish most. Our lovely planet. Use less paper. Recycle and re-invent garbage. I am currently having this mindset of creating things out of everything I consider as trash in my bedroom. I'm an architecture student and an amateur artist, and I am trying to keep my work habits and outputs as environmentally conscious as possible. I'll be pedaling my son up hill and over dale, the 1.5 miles to school from our house. Now just to get my bike tricked out for the Vermont winter! We are teaching our son and the kids at his school how to recycle And, what items are great not only for them, but for the future. It is hard to find great items like this in our area and this would be greatly appreciated if we won. Our son is just starting school, we have been teaching him how important the Earth is and how to help. We believe that the earlier we help educate his classmates, the better it will be for them and future students at his school. And, this would be great since we can show them that you can get some really cool school supplies that are great for the Earth! Would love my kids to sport the back pack. Boy, what a environmental conversation starter! I'm starting a conservation club for the local greenway. I plan to dump as much paper as possible and recycles what I have to use. This year's goal is to do the Bento Box style lunches, and to use LESS paper. Which is hard with a budding 7 year old artist. After spending 35 days out west in the National Park camping in our tent (dang we could have used a Voltaic charger!) I think the message of nature being a precious resource has really hit home. Leaves changing colors New school, new friends...new backpack? Happy days ahead. My fiance works in a daycare. During the summer the building they are is has very little air conditioning (window units in select rooms), so they escape to the park with the children a lot. She could have activities organized in the binders, keep hydrated with the bottle, have snacks in the lunch box and plan out and create future lessons/activities with the paper, pencils, and glue. All that and other required items (phone, band aids, towels, etc. ) would go perfectly in the back pack that would also keep the Ipad, used for stories, charged up and ready for nap time when they get back. the last 2 yrs my family and i have really got committed on going green,from the things we buy to the way we get around,its all green in our family!!! For me goin green has to do with my everday lifestyle in and out of school. As for school the way I'll be going green this semester will be first to clean out all the old stuff not needed for classes this semester meaning books, notebooks, and paper used. The books will be recycled either back to the school system meaning donated to the schools library/bookstore or to the local student bookstore. The notebooks will be reused for the new classes, or if too beaten up will be refurbished for my personal use to store my photographs and possibly school projects and papers. As for transportation we always try to car pool to and from school and every else in between, so instead of all of us using our gas we pitch in and ride with a friend or two if possible.....every penny counts these days with the price of gas! While at school I cant forget about my fluids, meaning stop buying and wasting money on water bottles for every other class and instead bring my own personal refillable and washable bottle for water, every little pice of plastic saved from the trash is always a little greener and even a fun way to show style depending on the bottle that I use every day for class. As for food I pack my own lunch/snacks, this helps out with excess waste thats not needed for the trash cans and also is easier to maintain a healthy diet for myself so that I dont have to rely on fast food. As for wrtining every day I either use mechanical pencils to cut out the use of wood, and also pens. There are soooo many more ways to go about doing this but this is what I try to do every day. Even the smallest things help, so if we all do a few small things to help they all add up to a big change or difference! Keep up the good work everyone and lets all make a difference! This year i'm giving up my car to use my bike and public transportation as my way to get to school. 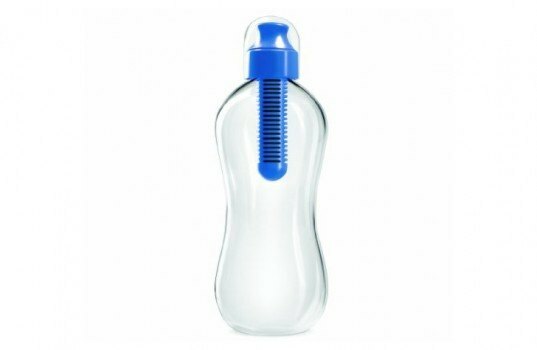 I'm also going to continue using my re-usable plastic bottle to bring water with me, thing that i've been doing for quite a while now but the bobble water filtering bottle would just fit me so well. In the same way i'm going to continue eating fruits as snacks at school, actions that helps me create conscious among my peers in eating healthy instead of buying junk food. And finally i'm going to sing up for the ecological workshop at school, which is involved in all kinds of eco-activities in-campus. Im a second year student of architecture and my aim is to develop a career in green architecture and all this fantastic goodies would just inspire me a loooot. For me going green has to do with my lifestyle in and out of school. As for school the way I'll be going green this semester will be first to clean out all the old stuff not needed for classes meaning books, notebooks, and paper used. The books will be recycled either back into the school system meaning donated to the school library or to the local student bookstore. The notebooks will be reused for the new classes, or if too beaten up will be refurbished for my personal use to store my photographs and possibly school projects and papers. As for the papers that weren't used they will be put into the notebooks for the new semester, but ones that are partially used will be saved for scratch paper and or used for printing if only used on one side. As for transportation we always try to car pool if possible so that we only use a small amount of gas compared to all of us by ourselves in our own vehicles.....every penny counts these days. While at school I can't forget about my fluids, meaning quit wasting money on a bottle water for every other class and instead use a refillable and washable bottle, every little piece of plastic saved from the trash is always a little greener and even a fun way to show style depending on the bottle that I use every day for class. As for writing every day I either use mechanical pencils to cut out the use of wood, and also pens. There are soooooo many more ways to go about doing this but this is what I try to do every day. Even the smallest things help, so if we all do a few small things they all add up to a big change! Keep up the good work everyone and lets all make difference! Love this! I would so love to win this for my 9-year old daughter who just recently got so immersed into green design and innovation. Shopping for a back pack this week for example, nothing was cutting-edge enough or "meaningful" enough for her, Disney backpacks and such all got that vomit gesture, you know. So I can already see her prancing around school, giving mini-eco-presentations to her friends. I'm studying landscape architecture, and I would use these fabulous tools to aid me in my studies. No more plastic sandwich bags, paper napkins, or plastic water bottles. This year we are using a super cool bento box, washable cloth napkins and a kleen kanteen stainless water bottle. If we win,we share. That's a win win! I'm studying Ecological Design at Prescott College in Arizona.... which basically translates to Sustainable Architecture... These gadgets would be perfect for the Regenerative Design semester I'm doing this fall. 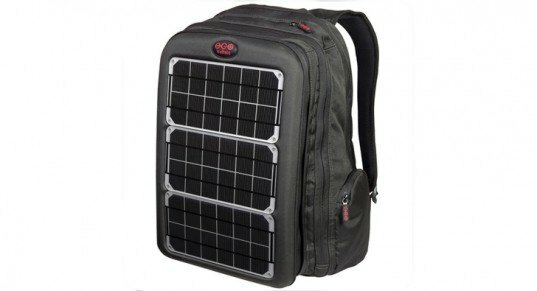 I'm OBSESSED with solar panels, and I need to keep my electronics charged all day to stay connected and prepared - this backpack would be great for all the biking I do! If I won this, I'd give it to my little brothers and sisters. We were barely able to afford school supplies this year, we are a family that has run into a lot of complications and difficulties in the past year or two. We try very hard to be eco-conscious with the little we have, but the hand-me-down school supplies are becoming ragged from use, their backpacks are literally held together with tape. If I were to "win" this, maybe instead of putting money towards new supplies, we could pay for my dad's MRI scan for his back issues. He's been putting it off so he could afford what my siblings need before himself, and this would be a huge help to my family. I love them, and they deserve the absolute best. I am a COTA in a very rural public school. We really do the best we can to provide our kids with the best education that we can, and feel strongly that the teachers and administration have those children’s very best interests at heart. Our school always promotes a green environment. In fact last year during our annual “Adirondack Days” celebration, our principal challenged the elementary school of 600 kids and over 100 staff and volunteers, to fill only one garbage bag following our school wide picnic. The rest needed to be recycled. Our school and its kids not only met that challenge but ended up with half a bag in the end !!! Pretty impressive I must say. This year we have initiated a composting program, and our Green Team is planning on a second annual adopt a plant program. If I am lucky enough to win this, I am certain that I can find homes for everything included with my students. I can’t wait to get back to my students and get the ball rolling on another great year! My older daughter actually is reusing everythint from last year - I purchased a couple of notebooks and pens but she did not require or ask for anywhere near the number of things the younger kids did. I try to encourage them to reuse whenever possible. This year I am trying to reuse and recycle school supplies from the last couple years for my kids. My children would be excited to get neat stuff like this. We homeschool, so my two biggest "green" goals this year are to drive less (I tried to make our extra-curricular schedule more efficient, so I can "kill two birds" whenever I have to drive across town) and cook more from scratch. This year instead of taking the bus i will walk to school. I also started a new thing around my block where i find things i can recycle. I also started to buy things that are eco-friendly. Im trying my best to make my own save the earth club. This prize will mean so much to me!!! Going on 50, so its time for a much needed change of pace! Going green is part of my plan, rejoining a college campus and studing solar tech is one of the many "new" things I plan on taking on for the second half of my life. I want to make a change in my environment for the better! No more hugh carbon footprints for me and my son. I want to win it for my mom to use as prizes for her learning disabled kids, as this is her last year working full time at the school system she has been with for 30 years now helping children with special needs. Nothing makes them more excited to learn and apply themselves than a tangible prize of some kind to help them see how proud some people are of their huge efforts and accomplishments. Our Green commitment is to walk or bike to school everyday. Seriously, going Green...been looking everywhere for that water bottle, saw it at work. Been filling my own water bottle with my Pure filter pitcher and work's filtration system. recycling all cans, bottles from work & home. Going to start my own mini garden, hand washing everything...just trying everything to go Green as much as possible. This year I will be using public transport to get to school and back. It may increase the time I spend commuting, but I can always use it to study. I'll be taking a packed lunch rather than spending money at the over-expensive cafes, and I'll be carrying a water bottle instead of purchasing bottled water every day. I am just finishing up my AA at our community college and then I'm transferring to a 4 year university. I am currently in process of converting my family's living into a more self sustainable way of life, but being I live in SE Washington I have found not much options in regards to solar. I use my laptop for and at school and have found the need to search out an outlet to recharge the battery isn't always easy. I also take it on road trips quite often and having a solar charging option would be fantastic. Thank you so much for offering this chance to win something that could benefit someone in a really great way. Bravo to you and whom ever wins! Great stuff - I'll be in India for 2 months - lots of possible uses! Heads up students! September is just one week away and school bells are already ringing in the distance - which means it's high time to start gearing up for the coming academic year. If you've yet to stock up on supplies, fear not - we're offering you a chance to win an amazing back to school bundle packed with over $500 worth of green goodies! You could win a powerful laptop-charging Voltaic Array solar backpack, a stack of 6 eco-friendly Naked Binders, a water filtering Bobble bottle, and courtesy of The Ultimate Green Store, a Laptop Lunchbox and various school supplies! It's easy to enter - all you have to do is sign up for our newsletter, like Inhabitat and Voltaic on Facebook, and leave a comment below telling us how you plan to green your back-to-school routine. Our contest ends this week, so don't delay - enter today!